Republican Gov. Bill Haslam presides over a meeting at the Jackson-Madison County General Hospital in Jackson, Tenn., about his proposal to extend health coverage to 200,000 low-income Tennesseans, on Jan. 21, 2015. NASHVILLE -- The fight among Republicans just got personal over Gov. Bill Haslam's proposal to use federal Medicaid dollars to fund his "market-driven" approach to making health insurance available to 200,000 Tennesseans. A new 60-second radio ad, paid for by the Tennessee chapter of the conservative Americans for Prosperity, singles out state Rep. Kevin Brooks, R-Cleveland, and accuses the House assistant state majority leader of "betraying" a promise to oppose "Obamacare." The ad cites Brooks' support last year of the Stop Obamacare Act and says it was aimed at preventing "Obamacare from destroying Tennessee's budget. "But now," the ad says, "Brooks is urging fellow legislators to vote for Obamacare. Kevin Brooks promised to fight against Obamacare. Now he's fighting for it. Why is Kevin Brooks betraying us?" AFP-Tennessee Executive Director Andrew Ogles said in an interview Thursday the group is running the ad because Brooks "is out there working to get votes so we just feel his constituents should know about it." Brooks said he's surprised by the attack, which is airing in his home town. "I really haven't had enough time" to decide whether he's backing fellow Republican Haslam's proposal, Brooks said. "That's what we're setting aside the special session to actually have these discussions, which is why I'm surprised that anyone would take a stance or make a statement in the press about my decision which has yet to even be announced." Brooks said what he has stated are "four very simple things. The current plan is Tennessee unique. It is Tennessee specific. It has no Tennessee tax dollars and the Tennessee Hospital Association has agreed to pay for any additional costs. And I guess that's what they're saying I'm trying to get people to vote for it." 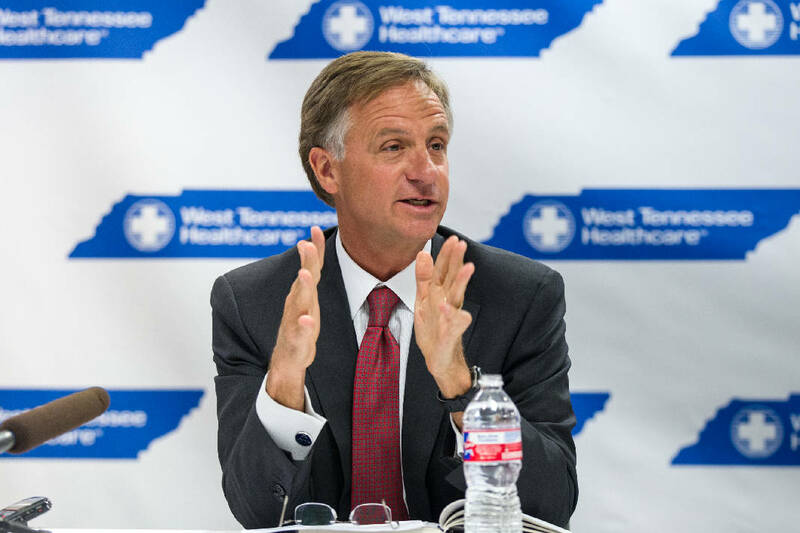 As Haslam traveled to West Tennessee on Wednesday to drum up support for his Insure Tennessee proposal, the governor declared, "This is not Obamacare. This is a different program that puts incentives in there for healthy behavior both on the user side and on the medical care provider side. And it won't cost Tennessee taxpayers another dime." AFP-Tennessee is also airing a more general radio ad attacking Haslam's plan in Chattanooga, Knoxville, Nashville and Memphis media markets as well as select other markets, Ogles said. That ad doesn't mention anyone by name. It says among other things that "Obamacare has been a disaster. Expanding Obamacare in Tennessee will be the same." The spot singling out Brooks, narrated by former conservative talk radio host Steve Gill, is the only one mentioning any legislator by name, Ogles said. Brooks said of AFP-Tennessee's move that my "grandmother used to say put your brain in gear before you put your mouth in action. I don't think they've put their brain in gear." The lawmaker noted he voted for the Stop Obamacare Act, which was a bill requiring specific legislative approval for any plan Haslam developed. Haslam's proposal doesn't amount to Obamacare, Brooks said. "It would be very, very Tennessee unique and Tennessee specific -- that's what makes the difference," Brooks said. "This is the Tennessee plan. This is not the ACA plan or an Obamacare plan." Haslam's two-pronged proposal includes a Tennessee Plan which would provide vouchers to workers interested in joining their employers' health plans. Another part, called Healthy Incentives, is a twist on the state's current TennCare Medicaid program. It includes premiums and co-pays for those with incomes above the federal poverty level and encourages healthier behaviors. After 2017, when the state begins bearing a share of the costs -- up to 10 percent by 2020 -- Tennessee hospitals have agreed to provide the state's share. That means there aren't state tax dollars involved, the governor has said. Haslam also said any agreement he strikes with the Obama administration will have an escape clause allowing the state to get out of the program if it proves unworkable or too expensive. "I understand some people don't agree with us, but I don't think it's a good thing for Tennessee when people come in with information that's just wrong and try to subvert the argument," Haslam said of some groups' criticisms. Contact staff writer Andy Sherat asher@timesfreepress.comor 615-255-0550.